← Think Albarino as an alternative to Chardonnay.. Ever wish you could jet away to wonderful wine country; tour wineries and participate in tastings; but time and budget are always against you? Here is a great way to escape to a region and explore the wonderful wines that are made there for only the cost of the wine! Sunday we escaped to Paso Robles California and no frequent flyer miles were needed! We scoured the wine cellar for a few bottles of wine made in Paso Robles and came up with a selection that even included a mini-vertical tasting of Pinot Noir, what a bonus! Paso Robles is the home of almost 200 wineries, many family run boutique wineries; most with limited production, small batch offerings. Many of the wines can be had thru private wine clubs. The wines we had on hand were 2007 & 2008 Pacific Coast Vineyard Pinot Noir; 2008 Turley Paso Robles Zinfandel Presenti Vineyard and the 2005 Paso Robles Syrah. The mini-vertical tasting of the Pinot Noir’s was quite exciting as the wine, only one vintage apart, were completely different in taste and complexity. The 2007 was a velvety creamy vanilla, completely balanced wine that would hold up well with a meal or perfect to sip alone (or with a friend!) This is a wine you could curl up in front of the fireplace with and sip all night. The 2008 Pinot was a much more traditional Pinot experience, fruity, fragrant with pleasant mild tannins on the finish; a good example of a fine Pinot Noir. We moved on to the bolder wines, the’08 Zinfandel and the’05 Syrah. First the 2005 Syrah; this wine was spicy and peppery with medium tannins. The Syrah fans in the group voted it a hit. The ’08 Turley was last to be tasted, and true to Turley form, this Zinfandel was bold but smooth and perfectly well balanced and had a long lasting finish. The group cast their ballots by rearranging the bottles in order of their favorites. 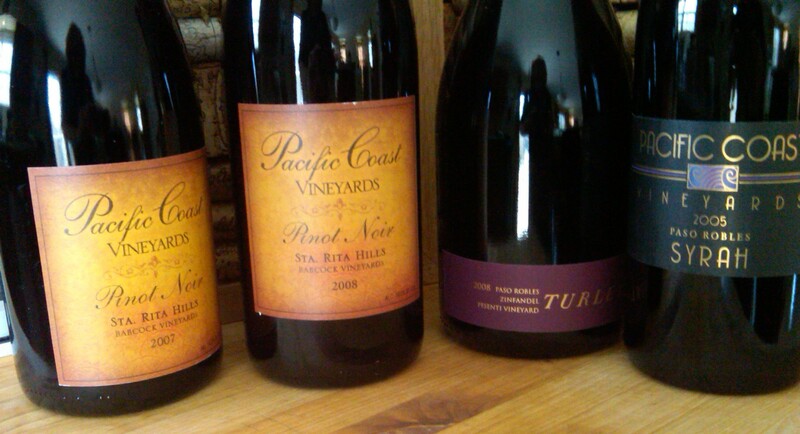 While some could not decide which one they like the least, most had chosen the 2007 Pacific Coast Pinot Noir as their favorite with the one dissenting vote for the ’08 Turley Zinfandel as their number one. This entry was posted in Pinot Noir, Syrah, Zinfandel and tagged Paso Robles, Pinot Noir, Syrah, Zinfandel. Bookmark the permalink.